The girl grows up and when she reaches the age, she gets married. The first night of her wedding, her parents try their best to protect her from the incumbent fate, using all possible means to defend the house until the new couple reaches their bedroom. 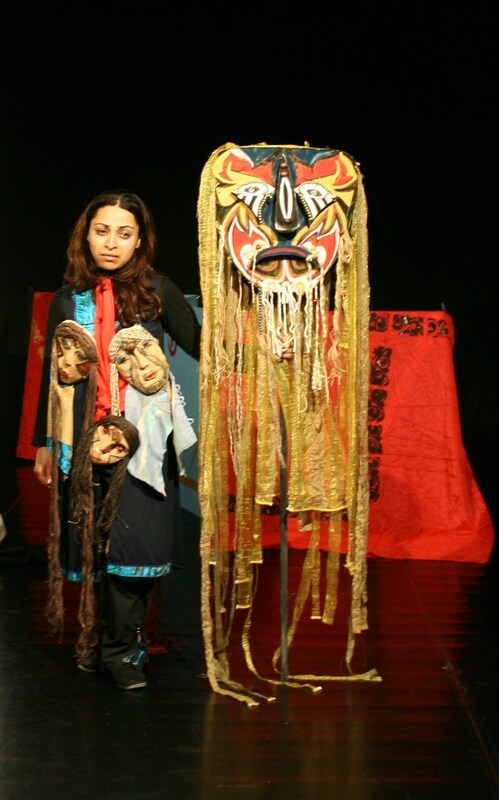 Our show is our free interpretation of an old Iranian tale, which is just the starting point to reach some of the social problems of the present time, in particular those related to the family life, and the relation between man and woman. So we can find out the raison why the couple cannot have babies and be happy: it is because of the fear, the lack of self confidence and serenity of the woman in her relation with her husband. The red apple is symbol of love that allows somehow the couple to cope with the fear and relational difficulties, and then to achieve the purpose of their love, giving birth to the little girl. But this is not enough to avoid that the daughter could inherit the same unresolved fear of her mother, a kind of problem deeply rooted in the traditional societies and cultures. That’s why the young girl grows up in the same difficult relation of her parents, and eventually gets devoured by the wolf, who is a symbol of the fear of one’s own body and of that her partner (in Iran they say fear is sister of death…). Starting from an old tale we tried to produce a show of modern theatre as far as means and intentions are concerned. Stage 6X6 meters minimum, black back-drops and wings, structures to hang lights and scenes, 24 theatre spots (better 16 theatre spots, 3 par 64 cp62, 5 profiles spots with large lens), 18 channel dimmers, console lights 24 channels double presets (better if programmable), console audio, CD player, 2 speakers 300 watt, 1 monitor speaker . We need two persons for help: 1 electrician, 1 stage hand. We must check also the possibilities for build some little scenography on wood directly there.